Baseball started in England in the mid-18th century as a simple bat-and-ball game. It was brought in North America by immigrants and evolved into a new and very popular sport. It is also the national sport of the United States. There are two teams, nine players in each, and they take turns in batting and fielding. Batting is done by the offense team and the fielding is played by the defense team. The players of the batting team take turns in batting the ball and once they hit the ball, they need to run counter-clockwise to the bases of the field until they reach the home plate again. They score when they return to the home base before the ball is returned. The batting team only has three chances to hit the ball. After that, teams change positions. The fielding team is the one in charge of pitching the ball to the batter and making sure that the ball reaches a particular base before the player of the batting team could. When both teams have had a turn at batting, an inning is completed. 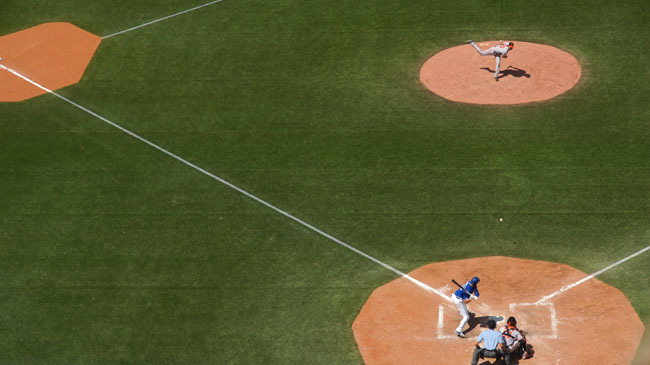 For baseball, there is a total of nine innings and there is no time limit for this sport. The team who scores the greater number of runs wins. T-Ball — an introductory sport for younger kids to baseball and softball, with the ball hit off a stationary tee. Rounders — played between two teams with a bat and ball, like baseball. British Baseball — a bat-and-ball game played in Wales and England similar to rounders. Over-the-Line – is a bat-and-ball sport related to baseball and softball with just 3 people per team. Unlike the other sports, the batter and pitcher are on the same team. Softball — a sport like baseball though the ball is pitched underhand, played mostly by women. Variations include fatspitch and slowpitch. Pesäpallo — a Finnish variation of baseball, the major difference is that the ball is pitched vertically. Brännboll — a Scandinavian game which has similarities to rounders, but with no pitcher. Palant — a Polish sport with lots of similarities to modern baseball played using a wooden stick and a rubber ball. Kickball — a type of baseball where the players kick the ball, instead of striking it with a bat. Lapta — a Russian traditional bat and ball game. Oină – a Romanian traditional sport, similar in many ways to Baseball and Lapta played outdoors by two teams of 11 players, taking turns either batting or catching. Danish Longball — a bat and ball game developed in Denmark, like a hybrid of baseball and cricket. Wiffleball — a variation of baseball designed for indoor or outdoor play in confined areas, using a perforated, light-weight, rubbery plastic ball and a long, plasticyellow) bat. Fuzzball — a street version of baseball played in some regions of the US. Stoolball — a team sport played on a circular grass field, possibly the precursor to cricket and baseball.